Who would have thought that Detroit Metropolitan Airport (DTW) and Harley-Davidson could have much in common? As it turns out, the Motor City airport and famed motorcycle-maker use the same robotic delivery carts to improve ergonomic safety for their workers. Harley and other large manufacturers have used high-tech carts from Daifuku for years; but the idea didn't transfer to the airport industry until well after 2007, when the material handling system manufacturer purchased Jervis B. Webb, which specializes in airport baggage systems. Daifuku Airport Technologies proposed its self-propelled carts to the Systems Optimization and Support branch of TSA, and one of the agency's engineers helped fine tune and vet the concept for use by TSA officers who lift heavy checked bags and drag them to inspection tables for manual screening. (Essentially, the company attached a TSA inspection table to the top of one of its existing automatic guided carts.) When Daifuku took TSA headquarters staff to see its equipment in action at Harley and other manufacturing sites, that set the wheels in motion for 11 of its Mobile Inspection Tables to be deployed at DTW late last year. "Automated carts have been used in other industries for 15 years or more," says Todd Alderman, director of Business Development for Daifuku Airport Technologies. "It's not new technology, but it's a new application for aviation. Harley-Davidson has been using it to build motorcycles for quite a while." DTW became aware of the laborsaving technology when planning recent improvements to the baggage handling system in its North Terminal. Working under another transaction agreement from TSA, the airport hired Logplan to create a design that integrates updated equipment into its conventional conveyor system. After Jervis B. Webb won the contract to construct/install the improvements, it proposed using Mobile Inspection Tables in the checked baggage resolution area; and the project team subsequently agreed. "The technology has been in use for many years, and its strong track record is well documented," says Tom McCarthy, vice president of Planning, Facilities, Design and Construction for Wayne County Airport Authority. Logplan Project Manager Michael Blanton was similarly comfortable: "Based on other uses of this technology, we didn't have any concerns it could function." Instead, project designers and engineers focused on ensuring that the mobile tables would interface properly with TSA computer screens and facilitate officers' various responsibilities. As McCarthy describes it, DTW likes to be on the leading edge of new technology, but doesn't take unnecessary risks to be first to adopt it. As such, there were lengthy discussions about equipment performance and lifecycle costs. Since Jervis B. Webb is located in Detroit, it was easy for the company to arrange local demonstrations and testing opportunities for a mockup of the proposed system. 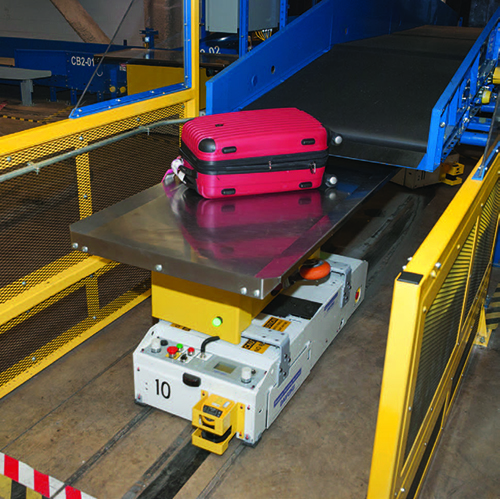 The demonstrations highlighted how much the carts could improve the ergonomics of a traditionally labor-intensive portion of the checked bag screening process. 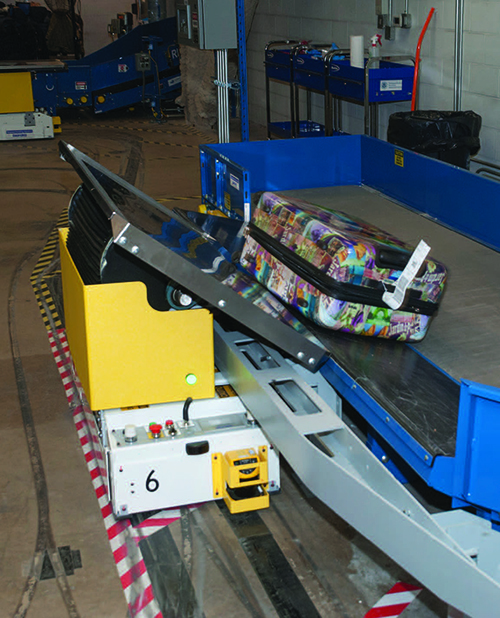 After luggage is screened by an explosives detection system, bags flagged for additional scrutiny are delivered via conveyors to the checked bag resolution area for manual inspection. Typically, TSA officers have to pull each bag from a conveyor, transfer it to a table, inspect the bag, and then lift it back onto a conveyor. Too often, the associated lifting and twisting motions cause back problems. "The conveyor process led to an overall inefficient work environment in terms of injuries," explains Alderman. "Mobile Inspection Tables are designed to improve ergonomics and efficiency. They eliminate any lifting, twisting or turning that has to be done by the TSA agents." Now, officers working at five inspection locations in DTW's North Terminal stay at their stations, and automated carts deliver baggage to and from them. When a bag is flagged for manual screening, it is transferred directly from the system's conveyor onto a cart, which delivers it to a TSA officer. The officer inspects the bag directly on the cart tabletop and then prompts the cart to return it to the conveyor. The self-propelled tables follow tracks of magnetic tape applied on the floor to make the trips back and forth. Traffic patterns for the magnetic tape are specifically designed for maximum efficiency and to accommodate TSA officers in checked bag resolution room. "The system is quite flexible," reports McCarthy. "Because the tracks are magnetic tape, we didn't have to modify the floor or the room at all to accommodate the MITs (Mobile Inspection Tables). If we need to make changes, the manufacturer has assured us it will require very little modification to the infrastructure." The carts operate on battery power (to eliminate tripping hazards of extra cords in work areas), and charge briefly when they stop to allow TSA officers to inspect their payload. The carts are also programmed to automatically charge during off-hours. When DTW's North Terminal originally opened in 2008, the baggage system was designed with two mirror-image systems. Each half can operate independently, and each can handle the entire terminal's baggage capacity in the event of a failure. Because TSA typically upgrades such systems every five to 10 years, DTW wanted to make sure it was adopting a system that didn't require a great deal of capital or downtime, notes McCarthy. Having duplicate checked bag resolution systems served DTW well when it added 11 Mobile Inspection Tables to half of the system in late 2016. The airport plans to add 11 more units to the other checked bag resolution area later this year. "We essentially shut down half of the operation in order to do the work on the first phase," explains Dale Walker, the airport authority's deputy director of Facilities Planning, Design and Construction. "We had to keep the bag system operating through the whole process." 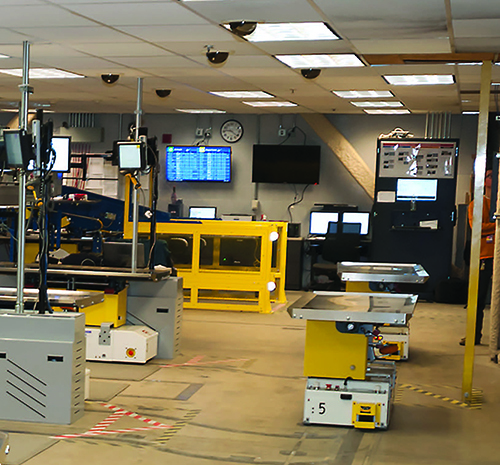 Once the Mobile Inspection Tables were operational, DTW tasked Logplan with ensuring that the new technology interfaced properly with all aspects of the checked bag resolution operation. It also performed independent customer acceptance testing. "Logplan inspected and tested the system to TSA standards," specifies Blanton, the company's project manager. "Once testing was completed, [we] submitted results to TSA, and based on those results, they scheduled their own follow-up set of tests." During its initial tests, Logplan verified that if a TSA officer is standing in an unexpected spot, carts will stop and wait for the agent to move. (Each cart is equipped with a laser sensor that detects objects in its path to prevent it from running over workers' toes or objects lying on the floor.) Personnel from TSA's Office of Occupational Safety, Health and Environment have also been working with the project team to satisfy potential concerns about the safety of employees working with Mobile Inspection Tables. Walter Dickey, acting manager for TSA's Electronic Baggage Screening Program, encourages airport officials to assess how new technologies such as the Mobile Inspection Table fit their specific needs. Moreover, he reminds them that TSA is not mandating use of automated carts. "We want airports to know that it's an option, but it may not be a good fit for every facility," says Dickey. "[Airports] need to understand the application to their environment to see if this would improve their operation." The implementation of automated carts at DTW demonstrates that it's possible to improve manual baggage screening operations with minimal modifications to existing infrastructure, notes McCarthy. "You don't have to cut the floor or run new power, and you have flexibility for the future," he explains. "If the TSA adds additional officers and equipment, you can easily move or add new tape without a lot of change at all." One company keeping an eye on the new technology is VTC. Chief Executive Chris Norton reports that she is already talking to Daifuku, and the firm's project designers are considering Mobile Inspection Tables for baggage systems at several airports. The company is excited to see airport equipment manufacturers incorporating technology from other industries, notes Norton. "We're also happy that TSA is clearly getting behind this project," she adds. Logplan's advice to consultants and airports interested in implementing the new technology? Work through the design thoroughly and allow plenty of time for integration and testing. "The design and function for this type of technology could differ greatly depending on the design and spatial constraints of each airport," cautions Blanton. Based on the success of Daifuku carts at Harley-Davidson and other manufacturing sites, company officials expect similarly positive results for DTW. Specifically, they predict that the airport and TSA will enjoy improved ergonomics, flexibility, productivity, room accessibility, noise reduction, energy usage and space reduction. Officials from the airport and its project team report that so far, the tables are working well and reaction from personnel using them is positive. "The primary benefit is improving the safety and health of the TSA officers doing the screening," emphasizes McCarthy. There's a new pipeline for products like the self-guided robot carts recently introduced at Detroit Metropolitan Airport: the TSA Innovation Task Force. TSA created the program in 2016 to receive, review and recommend new ways to improve screening operations at U.S. airports. Its intent is to provide a format for industry partners such as airlines, airports and manufacturers to develop emerging technologies in operational environments. In essence, the task force hopes to help entities vet and hone their developments by providing them with a better understanding of real-world screening challenges and TSA requirements. Before the program was formed, new projects tended to be treated as one-off requests, notes Innovation Task Force Branch Manager Mara Winn.